You guys, I love Whole Foods. It’s too expensive for my lifestyle though. The main thing I love is the salad bar and prepared foods section. It’s about a $9 lunch so I only allow myself to go about every 2 weeks. I have several favorites all of which I plan to recreate. To name a few: Sriracha brussell sprouts, cold sesame noodles with cucumbers, balsamic roasted beets, artichoke spinach dip, casear pasta salad, and the curried cauliflower. My goal is to try to make my own version of these and compare them to the real deal. 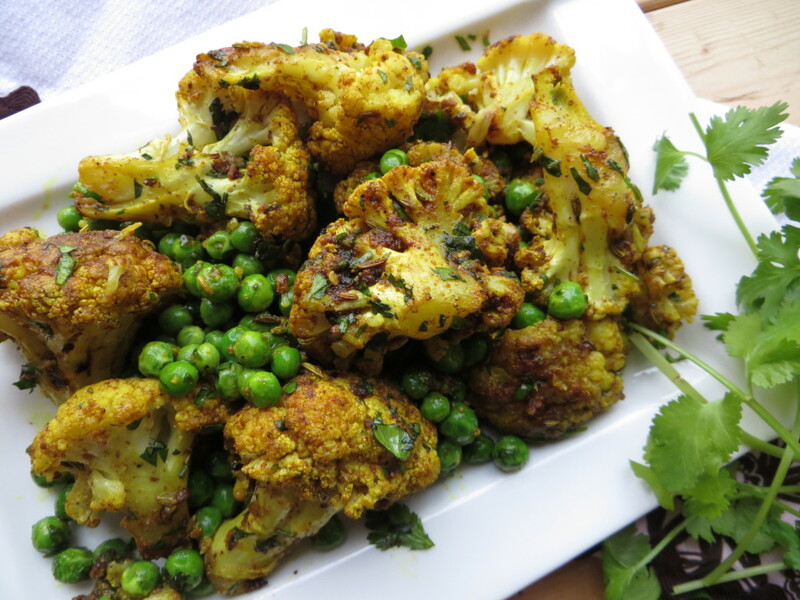 I only get the curried cauliflower every once in awhile because they are pretty rich and a flavor that requires “having a taste for”. 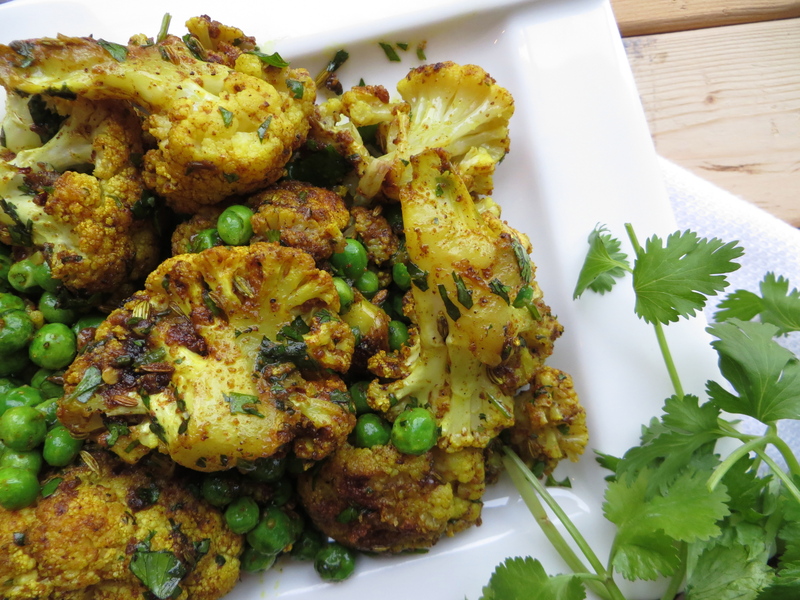 But I mean, who wakes up and says “Omg I am totally in the mood for curried cauliflower” No one. And that’s the special thing about the Whole Foods prepared food section. The one by work varies often so when my favorite ones appear that “taste” immediately happens. I usually get the little plastic container thing and give myself a small little bit of several items. Note to self: do not overload on cherry tomatoes their weight makes your salad $15. It really is the perfect lunch. I don’t think there is a Love Your Lunch recipe that beats a Whole Foods lunch. 1. In a small bowl, combine the oil and all of the spices and garlic. Stir to combine. 2. Toss in the cauliflower and use your hands to thoroughly coat the pieces. 3. Spread over a baking sheet and put in the oven at 350 degrees. 5. Remove from the oven and put into serving dish. 6. Add the peas and cilantro, stir and set aside. 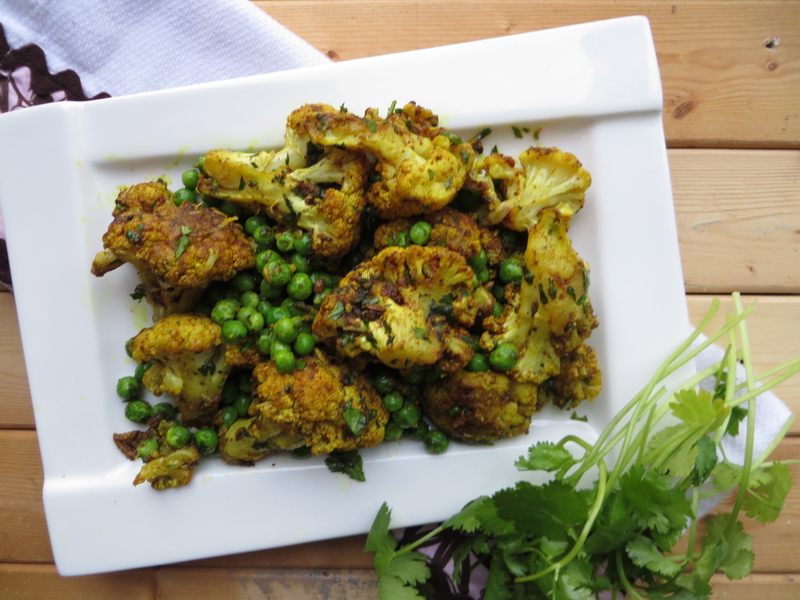 The heat from the cauliflower will “cook” the peas. Doesn’t really matter if it truly is memorable or even a sweltering your betterscooter.com’S happen to be neat!!!!! Your fifa 16 coins can be extremely major on my own feet. I visit quite a lot inside them. They are my favorite foot glimpse big we actually have big ft as it’s. hoverboard are usually more tasteful!! Pretty decent! You made some respectable points there. I looked on the internet for the issue and found most people will go together with along with your website. After research a few of the blog posts in your web site now, and I truly like your manner of blogging. I bookmarked it to my bookmark website listing and might be checking again soon. Pls try my web site as effectively and let me know what you think. These electric scooter are perfect! manner,awesome,classy….etc.etc….I obtained compliments all day long and they are true to dimension. I’m often to running a blog and i really admire your content. The article has really peaks my interest. 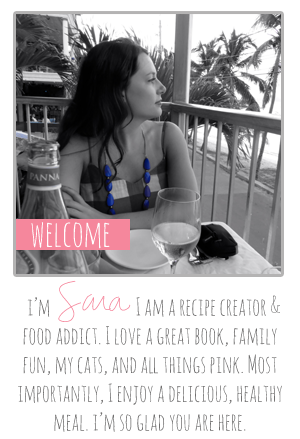 I’m going to bookmark your website and preserve checking for brand spanking new information. Spot on with this write-up, I actually think this web site needs way more consideration. I抣l in all probability be again to read way more, thanks for that info. I discovered your blog website on google and test a few of your early posts. Continue to keep up the excellent operate. I just further up your RSS feed to my MSN News Reader. In search of forward to studying more from you afterward!? Spot on with this write-up, I really assume this website wants rather more consideration. I抣l probably be once more to learn rather more, thanks for that info.